Just thought I would share a couple of pics of some recent behavior. The big yellow boat took about twice as long as I anticipated. I'm sure this has been ask here before and possibly me so my apologies for the mindlessness. I want to have some patches made that have my biz name & number on them that I can stitch onto my boat covers. Before I just pick some company off the internet, do any of you fine folks have any recommendations? Also, preference embroidered VS silkscreen. I made a bimini top for a pontoon boat and accidently stitched one of the frame pocket zippers on in the wrong direction. After correcting this little mishap, I now have a complaing customer who is worried that the holes are going to be a problem later. The zipper is 24" so I have a nice set of holes about that long. The fabric is 11 ounce Harbor Time which is very similar to Top Gun. I was thinking that if He (the customer) would just leave the top up for a week or two, the holes would close up. I also thought about trying to steam them. Any ideas other that replacing the entire panel? Does anyone know of a decent hand power or mechanical stapler that shoots fine wire staples? Occasionally I find myself in a situation where there is no electric or air and I need to staple stuff. Does anyone install a patch with your biz name and phone or web site to your finished canvas work, and if so where is a good place to obtain patches that will withstand outdoor use? I finally got around to making a tool belt. This one is for fitting the blank to the boat, and I plan to make another one for doing the final fit and snap installation. 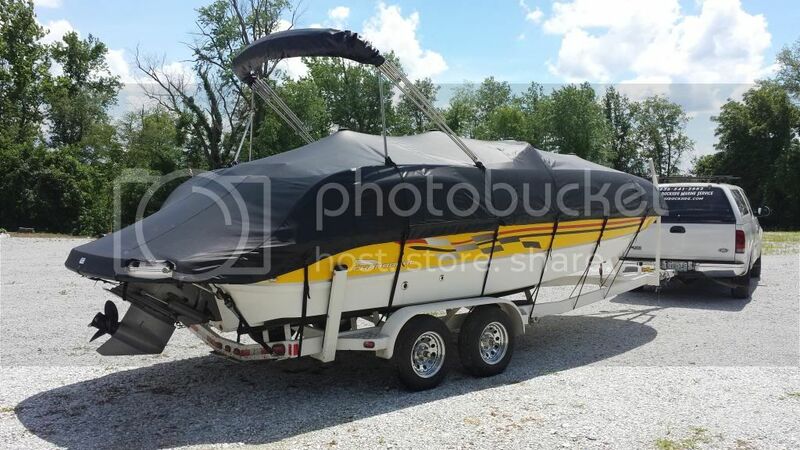 I have a customer with a 25' tri-toon that wants a custom cover, bimini top, and boot, and she wants it in yellow. I typically use Aqualon or Harbor Time and niether come in yellow anymore. Was hoping to find something besides Sunbrella. Any suggestions? General Discussion / More Marine Canvas Wrinkles Argh! What am I doing wrong here? Each cover I make seams to be a little worse than the one before it. I think I may have picked up some bad habits. I thought perhaps I was putting too many darts in my covers trying to make them smooth and tight so I was careful not to over dart this one, and as you can see in the pic, it is down right hidious. Suggestions welcome and appreciated. I haven't posted here in a while, had to go back to wrenching on boats over the winterizing season. Now I have a stack of boat seats to re-upholster over winter and my hands, specifically the thumb joints are killing me! I guess 30+ years of working with my paws has taken its toll. Anyone else deal with this, and what do you do about it? I have a customer wanting replacement carpets for a 21' bow rider. I have done a lot of carpet work but always glue in stuff. When making snap in carpets do you use regular marine carpet and just sew some biding around the edge, and what weight of carpet and what size binding do you use? Are there any do's or Don'ts that I need to be aware of? The Business Of Upholstery / Any success with craigslist? I have sold stuff on craigslist before but never advertised my services. Today I placed an ad for my boat cover business. I received four calls in about a six hour period. All wanted a "ballpark" price. 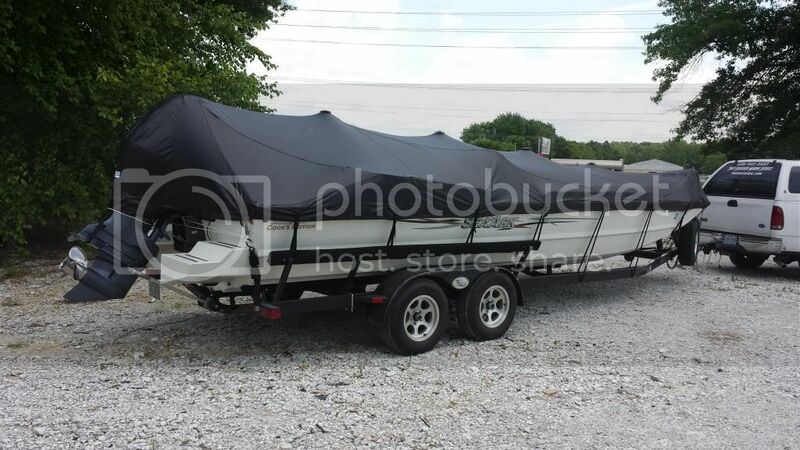 One guy says he will get back with me when he gets around to digging his boat out of storage, another guy has to discuss it with his wife, the third guy says he will bring his boat in at the end of the season and the forth guy is suppposed to drop off his bimin top first thing in the morning for me to fabricate a new one. I am trying to be positive here but I get the feeling I may be entertaining "tire kickers". The ad cost nothing, but the time spent on the phone cost plenty. Any thoughts on this matter? General Discussion / 108 degrees today! The temp hit 108 today in Missouri and the forcast calls for tripple didgets for the next several days. Installed a forward bimini on a pontoon and modified the cover to fit with the new top, I was wiped out. Can't wait to get back out there tomorro!